This post was a followup to The Evolution of a Personal Perspective on Creation and Origins, which should be read before this article. It was written for the same mailing list. This post has been edited slightly for clarity and privacy concerns. But I’ve still left it rather clunky. When I was talking with some Wheaton science professors about origins questions and Wheaton’s hint of an inquisition, in which there are four stated views (two of which are deemed acceptable), and they were complaining about the President thinking that everything fits into four neat pigeonholes: everybody must believe position one, two, three, or four. (So far as I know, none of the science faculty believe any of those positions — I don’t.) Then one of them stated, for the sake of fairness, that Wheaton at least allowed four views, while the media only allowed two: either you’re a young earth creationist, or you believe in Darwinian evolution, and that’s the end of that. I had hoped that the Megalist at least would be above this misconception, and it was with some sadness that I found this hope disappointed in the posts I’ve read (I’m offline; most recent post was one about a $1M donation to a young-earth museum). 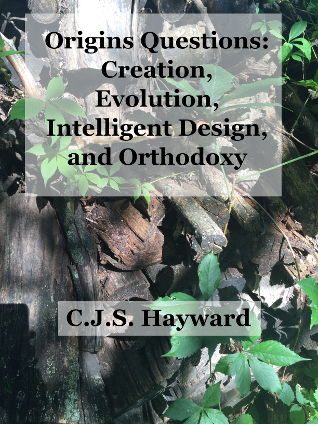 I have stated (or, more properly, implied) that young earth creationism is a marginal position among Evangelical scholars (I will not speak for Catholics or mainline Protestants, beyond to say that I expect them to be less inclined to young earth belief than Evangelicals). Augustine, who is portrayed by some Evangelicals as the good example of a solid Bible-believing pre-Protestant theologian, as contrasted to Aquinas’s dilution of Biblical faith with Aristotelian and humanist doctrine, did not have access to scientific inquiry concerning the age of the universe or the origins of life. His beliefs concerning origins were as far in technical detail from a young-earth story as would be a theistic evolutionary perspective. At Darwin’s time, Evangelicals were not generally young-earthers; a young earth perspective gained prominence for reasons to be discussed, but the old earth implied by evolutionary theory was not a surprising claim. I believe in an old earth; Johnson believes in an old earth; Behe believes in an old earth; Kenyon believes in an old earth. For that matter, the Scopes monkey trial’s Bryan, who was a member of the American Academy for the Advancement of Sciences, was not a Biblical literalist and did not believe in a young earth. That stated, I would like to give a fair treatment and (in some sense) explanation of young earth creationism, including its popularity among some devout Christians. This is not, and is not intended as, argument concerning origins questions, and readers who are looking for germane material that will inform considerations of origins questions can safely skip this note. It is intended as painting a fuller and fairer picture, of there being something to these people’s beliefs besides a vulgar belligerance towards science. In the following argument, I will make multiple Biblical references; these references are not here intended as appeal to religious authority, but as historical documents giving insight into how a particular people thought. Among those cultures that permit eating meat, there can be dietary codes concerning what meat is and is not permitted. The term ‘dietary code’ is often associated with Judaism, with abstinence from pork holding a symbolic meaning of ethnic and religious identity, but this is neither the only dietary code, nor the only meaning a dietary code can have. Contemporary American culture has a dietary code, albeit an unwritten one (beyond general health practices, and health code regulations about serving food). To give three examples of these unwritten rules: most Americans will not eat much of anything with a head on it or other visible reminders that the food is in fact the carcass of a slaughtered animal, will not eat much of any of the animals that are used as pets, and will not eat much of anything land-based with an exoskeleton. There are occasional exceptions to these rules — sardines, goldfish swallowing, and chocolate covered ants — but the exceptions are in fact occasional exceptions to general rules. These dietary restrictions are not thought of consciously, and when an American travelling abroad sees people eating meat in violation of such rules, his first reaction is not likely to be to think about how American he is by abstaining from such food, but more likely disgust that people are eating such sickening food. The quality of this perspective is representative of the most ancient Jewish attitude towards certain foods. The Torah lists a number of animals and tells people that they are to regard these animals as “unclean and detestable”, and are not to eat them (and someone who did became temporarily unclean). Uncleanness was not the same as moral defilement, and there were certain (albeit few) contexts (albeit not munching) in which texts reflect a social and religious permission to make oneself unclean. To eat unclean food was something you shouldn’t be doing, but it wasn’t something that had the particular meaning of treachery to Judaism, moreso than stealing — probably less; the injunction against stealing made the big 10. In Judges, one of the older post-Torah books, one that narrates the social and moral chaos before there was a king, the Nazirite Samson eats honey from the carcass of an unclean lion — maybe something a Jew shouldn’t be doing in general, but quite particularly something a Nazirite shouldn’t be doing at all. This action forms part of the story of a morally flawed, intermittently obedient hero, but it is not interpreted as being particularly goyish, not moreso than the other actions he took that broke God’s law. In Daniel, one of the latter additions to the Jewish canon, three sharp young Jews are brought to the palace of the king and make a big deal of not eating any meat at all, instead of eating the palace’s unclean food. On the evidence of the text alone, it is ambiguous whether eating unclean foods has acquired the symbolic meaning of goyishness, or whether it’s a matter that these three men were so devout that in a foreign land they would not compromise on even the issue of food. In IV Maccabees (not canonical to Jews or most Christians, but an ancient Jewish document that sheds light on the community), a Greek persecutor is trying to forcibly convert Jews to Hellenistic life, and inflicts gruesome tortures on Jews who refuse to eat pork. Here abstinence from unclean foods has very clearly become a (perhaps the) symbol of Jewish faith, and it holds this crystallized meaning to Jewish martyr and Greek persecutor alike. The near-total investment of dietary code with symbolic significance was not universal; one Jewish teacher said both “I have come not to abolish but fulfill the Tanakh,” and “What makes a man unclean is not what goes into him, but what comes out;” his disciples did not perceive any puzzling contradiction, and the movement he ignited from within Judaism is in numerous ways very Jewish to this day, but does not retain the dietary code. This has conditioned subsequent history; not all Jews today keep the dietary code, but there are some who are atheistic or agnostic and still keep kosher — which is to say that they are making a symbolic act that means much more than just a choice in food, that means an identity that they do not wish to disappear. The choices of the Jews in IV Maccabees do not exactly represent a claim that temporary ceremonial uncleanness from eating pork is literally a fate worse than death — a claim which is (at very least) hard to justify from the Torah. They rather recognized the literal act as the tip of the iceberg — and dug in, full force. Young earth creationism is not what it appears to be on the surface, namely a mere benighted refusal to open in the light of science. If it is viewed in isolation, on simply scientific grounds — including the $1M gift to a young earth museum — it will necessarily appear more than a little looney, as is the choice of being tortured to death instead of eating a few bites of foreign food. But it’s not that at all. It is a symbolic act, one that is so thoroughly a part of these people that it would not occur to most of them to call it symbolic. They may have chosen the wrong literal point at which to dig in — I believe so, pending scientific support for a young earth besides records of bizarre ways to fool scientific dating techniques — and that is to their discredit. What I am much more hesitant to criticize them on is why they are digging in. Suppose (for the sake of argument) that mathematics is required to hold as axiomatic that pi is equal to 22/7. It might be possible to pay lip service, claim pi to be 22/7 in certain circumstances, and otherwise get back to do serious mathematics. If that option were not taken, then the result would be a contradiction, from which anything would be provable (at least in certain fields of mathematics), from which point mathematics as we know it would be dead. Perhaps it might be possible to find some axiomatic revision of geometry that would produce a very different kind of mathematics in which there was something called a circle with a circumference:diameter ratio always equal to exactly 22:7. The point I’m getting at is that holding pi to be 22/7 might work for some not-seriously-mathematical purposes — you have to use some approximation for most numerical calculations — but the change would have far more disruptive implications for mathematics itself than might be obvious to someone looking in from the outside. There was one point when I was talking with an astronomy professor at Wheaton, and he mentioned a student who had been threatened by the old universe perspective of the class (until he explained that students were not required to believe in an old universe, although the class would be taught from that perspective), and I suggested talking on the first day about the grounds on which Darwinian evolution may be challenged — so that the young earth/old earth question is not the fully symbolic question of divine creation versus mindless forces alone, but only the question of whether the universe is thousands or billions of years old. He liked my suggestion. I have tried to give a sympathetic and respectful account of young earth creationists, not to persuade people that they are correct on the particular point they have chosen to dig in, but to suggest how something besides an insane aversion to listening to science might lie behind their choice. Having stated that, I would also like to state quite specifically that I disagree with their position, and regard it as unfortunate. For those wishing a further account (and something that provides a historical description instead of an analogy designed to convey a basic insight), I would reccommend Wheaton College Professor Mark Noll’s The Scandal of the Evangelical Mind, which traces the reactive movement you have encountered. For historical-cultural reasons Noll traces, Evangelicalism does not always share in the Christian tradition’s richer mental life, and among those who do not pursue the life of the mind, young-earth creationism seems a good way to assert God’s creation against teachings that life is the meaningless by-product of an uncaring universe. Among those Evangelicals and other Christians who do pursue the life of the mind, it is quite rare. For this reason, I would request that, when I bring up what Kenyon, or Johnson, or Behe, has said, and ask what your justifications for dismissing it are, please don’t post a rebuttal to six-day, young earth creationism. A comparable response on my part, to back up a statement that evolution is flawed, would be to post an attack on [very passé] Lamarckian evolution and consider myself to have discredited “evolution”. A non sequitur of that magnitude, on my part, could possibly destroy any chances I had of being taken seriously. Perhaps I am alone in looking at the question this way, but I want to respect my fellow Megalist members in this discussion, and it is awfully hard for me to maintain that respect when I see posts like some of the traffic in the recent past. Post Script, May 5, 2003: Since I posted this some time back, I have learned that leading members of the MegaList have become increasingly involved in the Intelligent Design movement. I do not believe I can take more than incidental credit for this; I believe they are persuaded, not by my eloquence in a small number of posts, but because the evidence itself suggests things which aren’t well explained by a purely Darwinian account.